Contrary to how I would have wished, we have only a few days until the NSW state election and I have yet to post anything substantial on the subject. So this is going to be another dense, intense and something-else-ense post. Firstly the baseline. Original margins courtesy of Anthony Green, as per usual and adjusted for recent electoral boundary shifts etc. The swing is calculated at 8% away from the Coalition based on the 2PP result in 2011 (64.2:35.8 favouring the Coalition) and the latest polling from Roy Morgan (up to March 23, 56:44 favouring the Coalition). This gives the Coalition 55 seats (LIB 38, NAT 17) and the ALP 34 with four tossups. 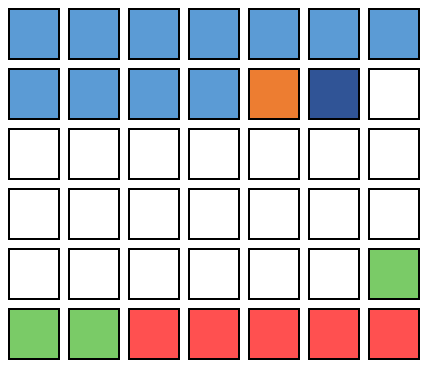 Since there are 93 seats, the maximum tossups allowed on this blog are (93/20 = 4.65, rounded down to) four. Now, after our previous success beating the benchmark based on past voting history, we’ll be playing around with those methods a little this time. In both cases there are some strong supporters of the Liberal (e.g. Vaucluse), Labor (e.g. Lakemba) and National parties (e.g. Upper Hunter), which is a promising start for a system of prediction based on seat consistency. Firstly, let’s try to quantify how consistently each seat supports a given party. 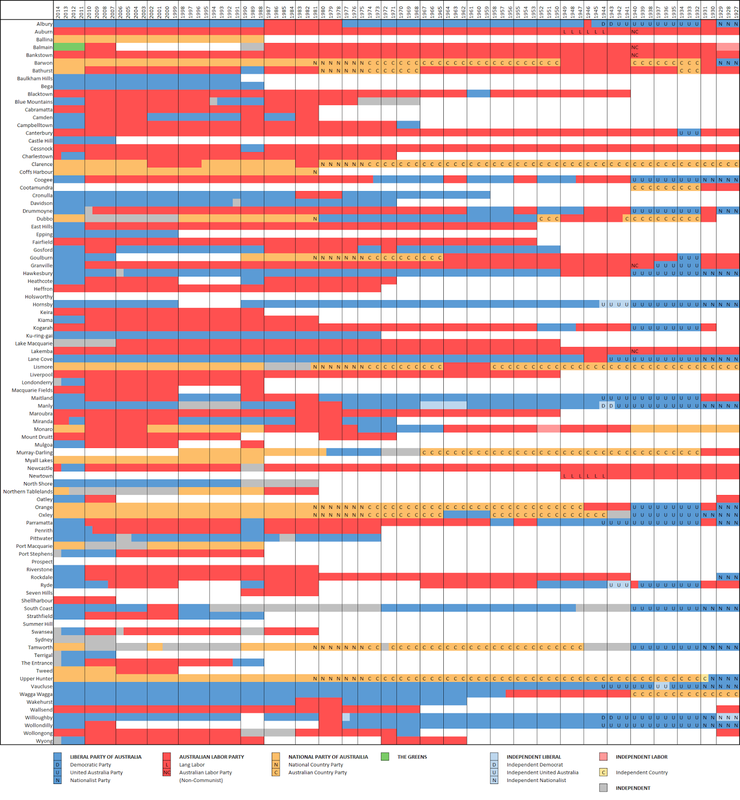 In the below chart, the parties are simplified to Labor or Coalition (Liberal + National). Each time the seat voted for the currently ruling Coalition parties, we add 1 to their total. Each time they vote Labor we subtract 1. Independents and minor parties contribute nothing positive or negative to the total. This produces a very primitive profile in the total column where 0 is neutral (voting for the Coalition as often as the ALP), positive numbers indicate the strength of support for the Coalition and negative numbers indicate the strength of support for the Labor party. However, since 1927 the Labor party has son more elections that the Coalition. This means any seat that has a 50-50 2PP history is actually slightly Coalition leaning by comparison with the state average. And, since polling is averaged across the state, this needs to be taken into account. For this reason the STATE column contains the value the seat would have held if it had voted with the rest of the state at each election during its period(s) of existence. The difference, in the DIF column, is simple calculated by subtracting the STATE benchmark from the seat’s TOTAL, giving the seat’s position relative to the general public. This number can also be reached by doubling the INDEX. The INDEX is calculated in the following way: starting at 0 add one each time the seat voted for the Coalition against the trend and subtracting one when it voted for the ALP against the trend. The DIF is double the INDEX because voting, for example, for the Liberal Party when the state was predominantly Labor actually increases the DIF margin by two – the seat’s total increases by one while the state’s total decreases by one. However, these values don’t take the length of time the seat has existed into account. Epping and Monaro both have an index of 3, having voted for the Coalition on three occasions more than for Labor when voting against the trend. However, because Epping has only contested four elections, this equates to a history of entirely Coalition victories, while Monaro has a much more evenly split history dating back to 1927. To combat this, the next table provides the index, the maximum (or minimum, for Labor leaning seats) value the index could have reached, and the percentage of times the seat favoured a party against the trend (INDEX/MAX x 100%). A PERCENT rating of 100% means the seat is a bastion that always votes for its preferred party, regardless of any other factor. This value can be diminished by voting for the “other” party, and this diminishing effect will be more significant if voting contrary to the general population. Thus a rating of 0% means either the seat always voted in line with the public (bellwether) or voted against the trend for one party as much as the other. Also, although this is already captured in the PERCENT, the CONTRA rating is the number of times a seat voted against its “preferred” party contrary to the trend. The PERCENT rating allows us to recognise what percentage of elections a seat has historically supported their “preferred party” in. If a seat has a 90% rating in favour of the Coalition parties, for example, it supports the coalition in all but the 10% most extreme of Labor-favouring elections. So now we need to calculate whether this coming election is in that 10%. The easiest way would be to look at all the 2PP results of Labor-won elections and see if the polling suggests the ALP: Coalition ratio is in the top 10%. Easiest mathematically, that is. Unfortunately pre-90’s 2PP data is scarce. Primary vote data, however, is abundant and given the inaccuracy of using decades old data to interpret current attitudes will hopefully suffice. Besides which, as Anthony Green points out [http://blogs.abc.net.au/antonygreen/2015/03/why-the-baird-government-is-vulnerable.html] the optional preferential voting system artificially inflates the 2PP vote. In only three elections since 1927 (1935, 1971 and 1995) has the winning party (and presumably 2PP leader) not been the leader of the primary vote (after combining all coalition votes and factoring Lang Labor into the ALP/NSW Labor vote). Which puts this election in the 90-100% range. This gives the ALP 20 seats, the same as last election despite all polls indicating a significant recovery from. The difficulty in determining the bracket a current election falls in is, it seems, a major problem with this method. What I will do, though, is look at the results after Saturday and work out where this election rates as compared to other elections and see if there is any obvious way to use this method in the future. In the meantime, this chart compares the Coalition 2PP result for each seat with the state 2PP result for the last four elections. This is represented both as an absolute difference in percentage points (“Dif”) and as a percentage calculated as (Seat/State)-1*100%, where a positive value favours the Coalition and a negative value favours the ALP. Both scores are averaged over the four years, or as many years as data is included for. Values are not recorded where the seat was not in existence (Balmain 2003, 1999; Castle Hill 2003, 1999; Cootamundra all years; Goulburn 2003, 1999; Holsworthy all years; Newtown all years; Oatley 2003, 1999; Prospect all years; Seven Hills all years; Shellharbour 1003, 1999; Summer Hill all years; Sydney 2003, 1999; Terrigal 2003, 1999; Wollondilly 2003, 1999), where the two party preferred count includes an independent (Barwon 2007; Cabramatta 1999; Charleston 2007; Dubbo all years; Goulburn 2007; Hawkesbury 2007; Hornsby 2011; Keira 1999; Lake Macquarie 2011, 2007; Londonderry 2003; Maitland 2007; Manly 2007, 2003, 1999; Newcastle 2007, Northern Tablelands 2011, 2007, 2003; Orange 2007; Pittwater 2007; Port Macquarie 2011; 2007; 2003; Shellharbour 2007; Sydney 2011, 2007; Tamworth all years; Willoughby 2007, 2003; Wollongong 2011, 2003) or minor party (Greens: Balmain 2011, 2007; Keira 2003; North Shore 2007; Vaucluse 2007)(One Nation: Cessnock 2003, 1999). By and large this correlates to the earlier prediction (shown in the COMPARISON column). Bathurst, Coogee, Londonderry and Riverstone are split on this method, favouring the Coalition based on the +DIF value and Labor on the +% score. These have been ruled as tossups. Drummoyne, Heathcote, Mulgoa, Penrith and Port Stephens prefer the coalition under this method, rather than the ALP. Conversely, Strathfield favours the Labor party. The COMPARISON value in these seats never exceeds 50%, and should be ignored. Tossups under this method result from a lack of data. Where this arises from Independents or the seat not existing the baseline from the polling will be adopted. This leaves Balmain and Newton, where the COMPARISON is 100% ALP but that ignores the influence of the currently incumbent Greens, and Sydney which has been consistently Independent. In the last election (the 2012 by-election) Independent Alex Greenwich received almost 47.3% of the primary vote. This was, however, without ALP contest and may subsequently see Mr Greenwich’s primary vote eroded to the point that he does not make it onto the 2PP list. If he does, however, he should comfortable defeat the Liberal candidate. Similarly the Greens primary vote, based on the Roy Morgan polling, has increased from 10.3% to 12.0%. It is probable that the Greens will retain both seats. The other consideration is Independents who may retain their seats. Normally these can be passed off as tossups, but there are too many this time: Lake Macquarie, Londonderry, Port Stephens, Swansea, Sydney, Terrigal, The Enterance and Wyong. Voila! LIB 35; NAT 16; ALP 34; GRN 2; IND 2; TOSSUP 4. Coalition Majority.